Slice the pepper in half to remove the seeds, and chop all the ingredients. Season with salt and pepper to taste. Enjoy with tortilla chips or as a garnish for steak or other dishes. A pinch of ground cumin may be added for a different taste. 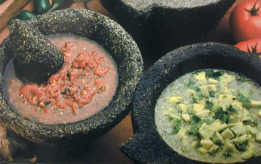 Puree the tomatillos, onion, pepper, and garlic in a blender or food processor. Chop by hand the cilantro, and cut the avocado into small cubes. Combine all ingredients in a serving bowl. Season with salt and pepper to taste.